lufthansa and lease corporation have first dibs on the planes due to their orders being placed first in March 2009. July 2017: Bombardier confirms that the first examples of its next generation Global 7000 private jet are undergoing final assembly. The newest jet has a $73 million pricetag. US$1 billion contract by the Victorian Government to install high-tech railway signaling that could enable trains in Melbourne to run as little as two minutes apart. Between 2012 and 2015 Bombardier expects sales to increase 30% ($16.8 -> $22.0 billion), a tall order given that revenue fell 8.6% in 2012. Most new revenue will be in aerospace: new fleet of aircraft being introduced: Learjet 85, CSeries (summer 2013). Higher revenue means more profit which could lead to more dividends and more investment, driving the stock price higher (normal p/e ratio). Between September 2012- March 2013 backlog up for jets 22.6% to $32.0b, down for trains 4.6% to $31.0b. cs100, cs300 first delivery in 2015, June 25 software upgrades delays first flight until September 16, 2014 - stock loses 4.5% day of the news. Delayed another 15 months to December 2015- Delay has been blamed on Transport Canada Certification Process (first flight program 2400 hours long). As of November 2013 there are 177 firm orders for the cseries (CS300 114/CS100 63) with 10 customers; up from 145 in March - Bombardier expects 300 orders by 2014 - Lufthansa and Odyssey account for 23% of firm orders (30+10). cseries seats 110-130 but reconfigured seats 160. 2005 -Bombardier first overseas firm to manufacture in Mexico (1800 employees). Montreal an aerospace hotbed.. CAE Inc of St-Laurent provides aviation training technology and services to 80,000 military personnel worldwide. Bombardier long term debt up sharply: Sept 2013 $7.240b +34% vs Dec 2012 ($5.405b). note: 2013 through 2032 business jet aircraft deliveries by region for all companies: America 9490, Europe 3900, China 2420. yearly demand to pickup ! -> 2013: 14,875 2032: 30,975. Positives - November 8, 2015 - PM Harper presides over the signing of a $1 billion aircraft deal btw Bombardier and China Express Airlines i) June 18 - VistaJet shows its happy with Bombardier business jets - completes $1.035b order for 40 Challenger 350 aircraft (founder Thomas Flohr actually stated his confidence in the jets comfort, technology, range (5926 km). VistaJet operates the largest fleet of business aircraft outside of North America. Deliveries of the Challenger 350 begin mid 2014. ii) June - $804m firm order for 12 Global 8000 business jets. iii) June - Horizon Air orders 3 larger range Q400 aircraft (total to 51) worth $98m iv) interest in C919 from China (twin engine airliner, all new design). June 2013 - $1.5 billion order . Potential of the Transportation division (trains, rail cars) not appreciated by investors ! v) Bombardier wins $2 billion contract from Deutsche Bahn AG for 450 rail cars (160 km/hr) - trains delivered by 2020, Transportation div is headquartered in Germany. iv) According to Odysey Airlines CEO, Bombardier has a flawless EIS Entry Inter Service with airlines. Key cSeries customers ok with first flight delay. v) 2013 Bombardier captured a 33% share of the entire business jet market based on revenue, 32% based on units delivered, down from 38%, 33% in 2012. book to bill ratio for last fiscal year is 1.7 / business aircraft sales up 10%. Learjet sales transitioning from small (40/45) to large (70/75). March 2014 - Russian crisis hits Bombardier: $3.4 billion deal with state owned Rostekhnologii involving 100 Q400 Turboprop aircraft being stalled due to sanctions implemented by the US and Canada. November 5, 2013 - President of Lion Air Indonesia says that his company is in the process of putting together a deal to purchase up to 50 Bombardier c300s series jets (seats up to 180, going price is $72 million each). The deal if done will be made in 1q2014. This is big for Bombardier since Indonesia was also the source of Boeing's largest single deal by volume ever made (2011 $22.4 billion). Lion Air has a 50% market share in Indonesia. 2014 is also when Lion Air will receive delivery of 36 new jets including its first from Airbus. Possible Negatives - i) no new cseries order at Paris air show despite orders for Embraer jets and 135 Airbus jets worth $11.9 billion ii) private jet competitor Embraer just announced a big order for its ERJ series aircraft (80 seats) from SkyWest (E175, E95), 100 firm orders and 100 options brings total order to 600 jets, but those jets won't be in service until 2018. That brings orders for Embraer's new E series (70 to 130 seats) to $22 billion. The new E-Series from Embraer has a new engine and improved wings. Sales of the smallest jet the CS100 will also have to contend with Mitsubishi's new 90-seat regional jet. iii) no new orders for cseries jets at the Paris air show (but could happen in the coming months). My advice - wait until test flight ! sales happen in cycles and can take up to 5 years. June 25 - cseries maiden flight delayed months due to software upgrades. C-Series first flight : September 16, 2013 a success!! takeoff from Mirabel airport, reached 12,500 feet. 1st delivery could be as soon as 12 months after that date. Competition: The Airbus A380 is currently one of the top choices for Airliners due to its fuel efficiency - it carries 100 more passengers than the 747 but burns 12% less fuel but at $375 million a piece the A380 is the most expensive aircraft. Lufthansa wants 50 of these planes in its fleet but only has 10. Boeing advantages: Recently updated their 737 planes by improving the fuel efficiency of their engines. As a leading aftermarket parts supplier, airlines would have an easier time getting parts for aircraft built by Boeing. Boeing is riding on its 787 planes, deliveries in 4q2012 up to 23 (from 2). Boeing 2012 commercial deliveries: 601 total (up from 480). Backlog at Boeing is $307 billion (4100 planes). Fiscal 2012 deliveries by type: 737: 415, 777: 83, 787: 46, 747: 31, 767: 26. Boeing Fiscal 2014 outlook: expect commercial aircraft deliveries to be up by 10% -> 720. FY2013 Boeing profit up 63% to 1.23b. Bombardier advantages: Bombardier's CSeries planes will be 12,000 lbs lighter than any other aircraft in the same category of seats. improved clean-sheet design gives it greater operational flexibility while reducing noise. Bombarider CSeries main competition will be from the Airbus A320 and Boeing 737 families. Issus with Airbus: The quality of its products was challenged on February 8, 2012 when Europe's air safety authority complained about the Airbus A380 super jumbo jet's airworthiness. The problem concerns the plane's Wing Web Feet which are the metal brackets connecting the wing's ribs to its skin. Currently 68 of those jets are being used by seven different airlines. The first incident that raised concerns happened in 2010 when the engine of a Quantas A380 disintegrated in flight. Delivery of the Airbus A380 was three years behind schedule, as of June 2013 first delivery of the A900 is 1.5 years behind schedule. Issues with Boeing: January 2013 - The US Federal Aviation Administration (FAA) 2007 decision to allow Boeing to use a specially made lithium ion battery to power its Dreamliner 787 aircraft, has come under scrutiny by the National Transport Safety Board which is concerned that a recent fire aboard a plane in Boston may not be a coincidence. As a result of two recent battery problems aviation regulators around the world stopped use of all 50 Dreamliner planes until further investigation. The Dreamliner 787 is the world's first carbon composite plane; they carry up to 250 passengers. The battery problem creates a real mess for Boeing because this battery best meets the performance and design objectives of the 787. Bombardier Fast facts - World's #3 aircraft manufacturer, #1 largest train maker, 70,000 employees, developed 4 generations of the TGV in France. The cseries has 177 firm orders, development of it has been a five year program. reconfigured design could seat up to 160. 2013 Deliveries target: In February 2013 Bombardier set its deliveries target for 2013 at 245 (vs 233 in 2012) - this includes 190 business jets and 55 regional jets. Orders: 4q2012 net orders for business jets +200% to 119. Total net orders for jets: third quarters have been great ! 3q2012 +30% to 45, 3q2011 +48% to 34. Turkey becomes the 10th CSeries customers. January through March 2012 weak qoq demand for business jets --> 49 gross/40 net (down from 85/77 in 1q11); commercial aircraft -> 28/28 (up from 5/5 in 1q11); Amphibious -> 0/0 (down from 4/4). CSeries --> 145 total orders as of March 2013, 138 as of February 2012. The company expets there to be 300 orders for cseries aircraft by 2014 when it enters commercial service. Cancellations: Business jet orders : 1q2012: 9 (up from 8 in 1q2011). Aerospace Revenue: September 2013 ytd: Business Jets $3,494m +11.2%, commercial aircraft $781m +5.5%, sale of used aircraft $500m steady. Sept 2012 year to date: Business Jets $3,142m +2.5%, commercial aircraft $740m -50%, sales of used aircraft $501m +28.1%, services $1,260m +1.6%, other $388m -3.7%. March 2012 qtr: Business Jets $643m -37.6%, Commercial Aircraft $168m -65.9%, other $131m +4.0%. Competition: Business jets: Embraer gets 21% of revenue from this sector versus ~20% at Bombardier (c.2010). Commercial Planes: 737 series represents 69% of Boeing's 601 deliveries (fiscal 2012) down from 79% in 2011 (379/480, 127 in 3rd). Boeing has four 737 models seating 110, 126, 162, 180 people (6-9% of them business class). 1q2013 56.6% of Boeing's revenue from commercial aircraft ($10.7/$18.9). 4q Boeing 787 deliveries: 23 (up from 2). Financials: 2013 3Q (3 and 9 months to September) - effective tax rate was 15.5% and 24.7% respectively (versus 23.6%, 18.8% in 3Q2012). 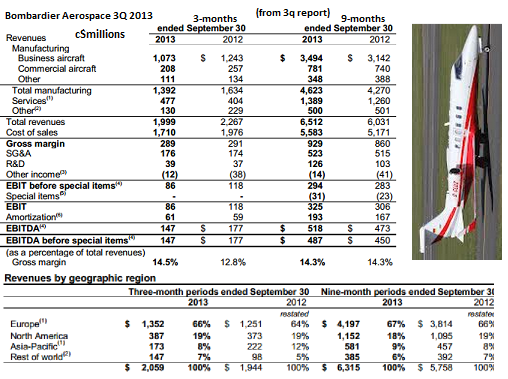 First 9 months of 2013 revenue $12,827 (+8.8%) 50.8% from aerospace (+8.0%) 49.2% from trains (+9.7%). Trains segment reported better EBIT margin (6.5% vs 6.2%), for planes it was 5.0% (vs 5.1%). earnings at $475m (+$1.0m), eps $0.26 (steady). total backlog $65.5 billion up from $64.9b Dec'12. Bombardier is a Dorval, QC based producer of light rail/subway cars and most importantly small and large jets (most popular are the challenger and global families which delivered 50 units (combined) in the first half of 2011) with production facilities in many countries including Canada, Mexico, India and Ireland. The aerospace division is best known for its business class Learjets (sold 19 first six months of 2011). March 2013 total company backlog: $63.0B (up from $58.6B Sept, $55.2B Mar, $53.9B Dec 2011); In 2013 Jets backlog exceeds Trains backlog for first time ! compared to the previous year (quarter to quarter) jet backlog is up 37.3% to $32.0b consequently trains backlog is down 3% to $31.0b. 1q2013 Jet backlog of $32.0b is up 68% since the end of 2010. (latest backlog data from 2013-2014 shown in data above). The Learjet 85 has been in development since 2008, by 2012 it had more than 60 orders in place even though first delivery isn't until 2013. It is the world's third largest manufacturer of planes next to Boeing (USA) and Embraer (Brazil). On June 25 it was announced that first flight of the larger CSeries aircraft would be delayed at least one month pending software upgrades, as of March 31, 2013 there are 145 orders - by July 2013 orders upped to 177. Bombardier targets 300 orders for cseries by 2014 when the plane first enters commercial service. Loyal customer VistaJet operates the largest fleet of business aircraft outside of North America. In 2005 Bombardier became the first overseas firm to manufacture aircraft parts in Mexico - Mexico has since becomes a top 10 supplier of aircraft parts. 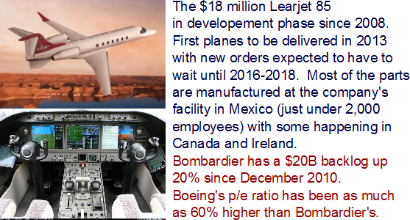 1800 people work at the Learjet, Global 7000, 8000 series production facilities in Mexico. What's most attractive about Bombardier's stock is that even with all the upside to the company (backlog, new jets reaching first flight, new deal in China, framework for a long term strategic partnership with Comac signed in March 2011, strong order in rail cars, increasing market share for business jets, revenue up 25% quarter ended March 2013 (though not much growth in earnings +$7m to $148m); revenue 18.2% in the quarter ended July 2011, net income up 48.9% qoq) its price to earnings ratio is currently 14.52 (May 29, 2013) up from 8.30 (Nov.5,2011) but still lower than key competitors Boeing (May '13 18.77; Nov '13 13.03) and Embraer SA (24.31 May'13 up from 10.84 Nov '11). more PE Ratio's: July 20, 2012: 8.65 versus Boeing 12.85 and Embraer 67.08 (P/E ratio 7 months prior on Jan.30, 2012 was 8.55 for Bombardier, 13.94 for Boeing and 15.07 for Embraer). 9M2013 - First 9 months of 2013 revenue $12,827 (+8.8%) 50.8% from aerospace (+8.0%) 49.2% from trains (+9.7%). Trains segment reported better EBIT margin (6.5% vs 6.2%), for planes it was 5.0% (vs 5.1%). earnings at $475m (+$1.0m), eps $0.26 (steady). 1Q2013 - For the first 3 months of 2013 42.77% of Bombardier's revenue came from the jet segment ($1.499B) down from 46.94% in 2011 ($2.188B). Aerospace contributed 42.33% of EBIT ($91M) down from 45.19% ($141M) in 2011 ($171M). more... revenue +24.6% to $4.339 billion ($2.258b aero +50.6% / $2.081b trains +5.0%), gross margin +7.1% to $616m ($307m aerospace +29.0% / $309m trains -8.3%). earnings $148m (-$7m). Backlog $63.0b ($64.9b Dec 2012), $32.0 BA/$31.0 BT). 9M2012 - For the first nine months of calendar 2012 Bombardier revenue stood at $12.013B down -14.4% from $14.031B in 9M2011.. 51% of revenue came from aerospace. 3Q2012 profit was up +7.7% ($209M) on lower revenue (-6% to $4.338B): Transportation division contributed $2.2B (-9%) in 3Q2012 revenue representing 48.4% of total revenue. Total company earnings per share (EPS) was 34.6% higher for the first three quarters of 2011 calendar year to 35 cents from 26 cents. Dividend/share was up only 28% or 2 cents in the nine months. In the 1Q2012 eps was 10c down from 12c in 1Q2011. 9M2011 - For the first nine months of 2011 46.9% of Bombardier's revenue came from the jet segment ($6.578B) up from 46.5% in 2010 ($5.718B). However airospace division contributed only 41.25% of EBIT during the period ($375M). In the third quarter (2011) the company made 68 deliveries in total (Boeing made 127). In fiscal 2011 250 delivers were made. In the first quarter (2012) the company made 37 aircraft deliveries (down from 61) and reported 68 net orders (down from 86). Boeing --> 79% of its 480 annual delivers are for the 737 class model which Bombardier hopes to take away market share in with its new line of 200 seater planes. Though annual aircraft deliveries were down in 2011 to 244 from 302, the company is readying its newest jets for first flight (will raise deliveries in 2012). Bombardier's newest jet manufacturing plant will be in Morocco. The plant will employ 850 people at its peak and cost $200 million to build. Bombardier rail cars were first introduced to New Delhi in 2009 (initial installment was for 36). By August 2011 450 Metro cars were delivered to Delhi Metro with 88 to be sent in the last quarter of 2011. The contract for 538 cars was signed July 2007. Majority of the cars used in New Delhi are from the 6 coach model. The company is also selling midsize planes: In August 2011 Russia's Ilyushin Finance Corp commited to the purchase of 10 CSeries aircraft for $660 million. October 29, 2011: Bombardier sells six large aircraft to China's Express Airlines, getting the first in a series of contracts with the Chinese airliner worth between $254 and $491 million, signed. There's also an option for an additional five. The aircraft involved is the CRJ900 NextGen which is similar to the 50-seat CRJ200 Bombardier planes already in use at Express Airlines. The first six make the deal worth $254M but the options on the other five increases the value to $491M. Only about 80 Bombardier planes are currently in use in China (CRJ, Q Series). China Express is China's first private airlines. Bombardier + Comac ? It is rumoured that Bombardier and Comac are in the process of partnering together to create a legitimate rival to Boeing and Airbus in the 140-200 seater airplane market. The framework for a long term partnership with Comac regarding cooperation in the marketing and manufacture (synergies/collaboration) of commercial aircraft specifically the larger C919 series planes, was signed on March 24, 2011 in Shanghai. Comac has only existed since May 2008. Comac's C919 model will seat 168-190 people slightly higher than Bombardiers current CSeries which has 110-149 seats. February 10, 2012: Garuda Airlines of Indonesia purchases six CRJ1000 96-seat jets and options another 18. Bombarider will receive $297M for the six jets however if the options are exercised it will earn another $1.023B for a total of $1.32B. It's a much needed contract for the company's regional jet division which only got seven orders in the last 12 months. The carrier officially announced the deal on February 15. The company's backlog of CRJ's is 46 which is only 18 months work. Other CRJ clients include Air Nostrum, Britair. February 19, 2012: Bombardier lands another contract order for the C Series, C100 midsize aircraft, this time from a brand new customer, Switzerland-based PrivatAir SA. The contract calls for five aircraft at a pricetag of US$309 million (a further US$327 million would be made if PrivatAir picks up the option for five more planes). The C-Series planes vary in size; the smallest hold 100-125 seats while the largest is between 130 and 145. C-Series first flight will happen between November and December 2012. C-Series already has 138 orders and 124 options. Among committed customers Republic Airways Holdings leads all in terms of orders. Bombardier Transportation operates in more than 60 countries. Germany's Deutsche Bahn is one of its biggest customers - since 1992 has purchased 2000 double decker railcars from Bombardier. JETS: Bombardier CSeries will be powered by Pratt & Whitney PurePower PW1500G engines. November 5, 2013 - Lion Air of Indonesia plans to order up to fifty Bombardier c300s series jets. The deal if done will be made in 1q2014. This is big for Bombardier since Indonesia was also the source of Boeing's largest single deal by volume ever made (2011 $22.4 billion). Lion Air has a 50% market share in Indonesia. 2014 is also when Lion Air will receive delivery of 36 new jets including its first from Airbus. October 5, 2013 - Apec summit couldn't have been at a better time for Canada - Bombardier is in the process of providing the host city Kuala Lumpur with new subway cars. June 25, 2013: Bombardier delays maiden cseries maiden flight up to a month due to software upgrades and vibration tests. Stock loses 4.5% of value day of the news. April 2013: $440m contract with Siemens to supply new components for NextGen high speed trains. April 22, 2013: RwandAir places an order for one Q400 nextgen turboprop jet for $33 million. When delivered, RwandAir will be the 12th airliner in Africa to operate Bombardier's Q400 aircraft. Q400 popularity is destined to grow given that it increases profitability for airliners (seats twice as many passengers versus similarly used jets). The Q400 dual class seats 67. Up until April 2013 Bombardiers Q400 aircraft have been used to transport 243 million passengers globally (468 orders in total). Nov 7, 2012: Bombardier delays first flight of the CSeries jet aircraft until June 2013, surprising many after stating just last August that it was within 3 to 5 months of first flight - The delayed aircraft is the CS100 jet however the largest of the jets (CS300) remains on schedule to reach market by 2014. The CSeries planes will seat anywhere from 100 to 149 passengers (comparable to commercial jetliners produced by Airbus and Boeing). The biggest competitive advantage Bombardier planes have is their fuel efficiency (+20% vs the competition). Bombardier is investing $3.3 billion to develop the CSeries jets. News of the delay caused the stock to lose -3.9% on the day. The delay shouldn't come as a surprise ! The Boeing widebody 787 Dreamliner release was three years behind schedule as was the Airbus A380. Bombardier CSeries will compete with the Airbus A320 and Boeing 737. Deliveries of the CS100 jet series will begin 12 months after first flight. Nov 7, 2012: Bombardier announces that its rail division Bombarider Transportation will shed 1,200 employees or 3.4% of its workforce (35,000). The closure of a rail facility in Aachen, Germany will account for 350 of the jobs lost. September 18, 2012: Signs $367M deal with Talgo SA for 36 high speed trains to be used in Saudi Arabia. The trains have a speed of 450 km/hr. Bombardier will also provide maintenance services. Train plant in Trapaga, Spain will carry most of the work. June 12, 2012: Bombardier wins its largest order for business jets in company history ! The deal comes courtesy of a Warren Buffet controlled company called NetJets. The deal with Bombardier calls for $7.3B worth of Challenger Business Aircraft (100 firm with another 175 optioned). The deal has a worth of as much as $9.6B (comparable to the company's annual revenue stream) and immediately boosted Bombardier's stock by +10% on the day of the announcement. NetJets is also buying another 150 planes from Cessna and that pushed Cessna's parent company's stock up by +2.8%. March 2012: According to the International Air Transport Association, air travel (kilometers) was up for both international travel (+8.2%) and domestic travel (6.0%). Plane occupancy levels were also up, to 77.7% (vs 74.5%) and 77.3% (vs 78.4%) respectively. That bodes well for Bombardier which received 28 net orders for commercial aircraft in the 3 months ended March 2012 up from 5 in 3 months ended April 2011 (however, aircraft deliveries were down to 7 from 23). Bombardier net orders for business aircraft stood at 28 down from 40 last year. Business aircraft deliveres: 29 (down from 37); orders for all 5 types of business aircraft were steady or up with the exception of large business jets (Global 5000/Global Express XRS/Global 6000 net orders down to 4 from 15). March 2012: Signed a definitive agreement with China's Comac to collaborate on building aircraft that are already similar (Comac C919 Bombardier CSeries). June 6, 2012: Bombardier wins a $599 million contract with the New York Metropolitan Transport Authority. The deal calls for 300 underground subway cars (R179 model) which will be built at a manufacturing plant in Plattsburg, NY (center location of the company's Mitrac propulsion equipment/energy-efficient inverters business; the new cars will be equipped with that technology). As of June 2012 Bombardier has the following subway/rail car orders: 300 for NYC, 706 for Chicago and just under 900 for Montreal, Toronto (combined). Train/rail cars: December 28, 2011 Bombardier wins a US$296 million contract for 130 of its signature Electrostar cars. The cars will serve south London, UK. Possibly giving the company favour with British tramway is that it is the only remaining company that builds trains in the UK. There are already about 2,000 Electrostar cars already in use in Britain. On that day Bombardier's P/E ratio remains near the industry low at just over 7.23 times compared to 14.71 for Boeing and 13.87 for Embraer SA. Bombardier Trains division backlog is $33B as of October 2011, unchanged from the previous year. December 23, 2011 Deutsche Bahn orders 90 more 430 Series trains for US$648M. In 2011 Frankfurt, Germany is resonsible for 87 other orders of the same model. The trains will be used on a 7.2M km train track area annually, reach 140 km/h speed and will be made in Germany. First delivery is scheduled for 2014. Problem for the Trains division during the 3Q2011: Lost £1.4 billion British contract to Siemens in July. Calling the contract loss a surprise is an understatement: Bombardier had public support because it would have made the trains UK built. Bombardier operates Britain's last remaining train factory, located in Derby. Half of the workforce at the Derby plant are at risk of losing their jobs. Later that month a train crash in Wenzhen, China involving Bombardier cars sent the stock down more than 2%.